Your choice, your voice! Before voting in this India Elections 2014, start playing Kursi Cricket game online or on your mobile devices and convey your opinion to your friends as to whom you give the vote. 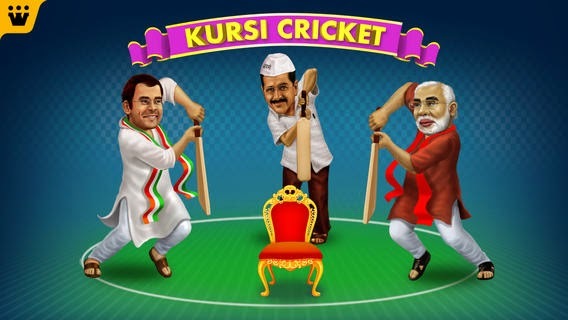 In Kursi Cricket game the prime ministerial candidates Narendra Modi, Rahul Gandhi and Arvind Kejriwal these three are ready to bat and score runs. You can bat for the leader of your choice and hit fours & sixes. Start playing the game selecting a leader you like to bat for. The opposing player will be decided automatically during the play. For example, selecting Modi as your batting hero, you can go for batting. As an opposition player either Rahul or Kejriwal, one among them will come. Now, one member will do the batting and it is to be decided in the beginning as to up to how many wickets game is to be played. That is to say one person can play from 1 to 5 wickets. If out for 5 times, your innings is completed. While batting this is how you can score runs – there will be a line before you with marked numbers 1, 2, 3, 4, 6 and on to which number you will beat the shot that is your score. And how to do batting? When the ball is bowled, to hit the ball tap the space bar while playing online or tap on the Bat button viewed on the mobile screen. Depending on your good timing of the shot and practice you have, the score of your batting hero will continue. Connecting to the internet you can share the total runs you score on social networking sites Facebook, Twitter and Google+ and also see the global rankings of your favorite batsman. 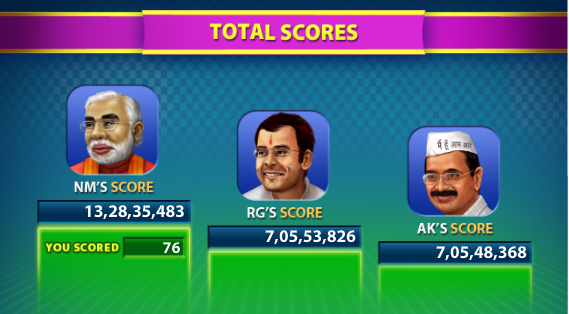 +Narendra Modi is having the highest score and continues to take the lead way ahead of Rahul Gandhi and Arvind Kejriwal. Download Kursi Cricket android app and start scoring for your favorite leader on your Android Phone and Tablets. Apple iPhone and iPad users can obtain Kursi Cricket app from iTunes.